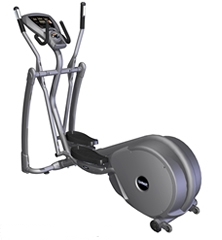 The Smooth CE 3.2 elliptical trainer is an upgrade on their 2.1 model. It has some additional features that will appeal to hard-core fitness users that make it worth the extra few hundred dollars. As with every Smooth elliptical trainer, it has an incredibly smooth glide and comfortable feel. It also has the same stylish oval tubular framing that attracts buyers who want their exercise equipment to look good as well as perform. UPDATE: The Smooth CE 3.2 trainer is no longer being sold. You can check out our list of the best ellipticals $1000-$2000 for a comparable machine. If you ask a trainer or fitness professional, he or she will tell you that you should spend the extra $200 and move up to the Smooth CE 3.2 elliptical trainer if you are considering their entry-level 2.1. It’s not that the 2.1 isn’t good – it’s also a great machine. But trainers will tell you that, especially if there are several people in your household who will be using your elliptical trainer, the ability to program in nine personalized routines is a great benefit that you seldom find in a mid-market offering. The chest strap heart monitor is preferred by most trainers over any pulse grip monitor because it’s more accurate, but by offering both with the CE 3.2, Smooth Fitness has covered all the bases. Anyone who owns a Smooth CE 3.2 elliptical trainer appreciates the silent, satin-smooth ride. They also note that on the very rare occasions when customer service is needed, it is exceptional. The feature that users are most impressed with, however, is the improved LED computer console display. It’s one of the components that were overhauled recently in response to customer observations, and Smooth has made it more attractive, more user friendly and packed it with features. For $1400, you’re getting a rock-solid machine that you’ll love using. Programming in your workouts and taking advantage of the numerous features on the newly designed console will keep you from getting bored any time soon. Combined with the patented pivoting foot pedals and the eddy current braking system, the feel of the Smooth CE 3.2 elliptical trainer is exceptional on all counts.